Reducing the school-to-prison pipeline for minority students is becoming a major concern across the country, especially in those states where there is growing evidence that detentions, expulsions and arrests are issues more to children of color for lesser offenses. One of the nation's largest school districts, law enforcement and the NAACP have reached a deal aimed at arresting fewer students for minor offenses and cutting down the so-called school-to-prison pipeline, which the civil rights group and others say disproportionately affects minority students. The agreement with Broward County Public Schools in Florida announced Tuesday is one of the first comprehensive plans bringing together district officials, police and the state attorney's office to create an alternative to the zero-tolerance policies prevalent in many schools. It charges principals rather than school resource officers with being the primary decision makers in responding to student misbehavior. The move is designed to cut down on what has become known as the "school-to-prison pipeline," where students accused of offenses like disrupting class or loitering are suspended, arrested and charged with crimes. Broward, the nation's sixth-largest district, had the highest number of school-related arrests in Florida in the 2011-2012 school year, according to state data. Seventy-one percent of the 1,062 arrests made were for misdemeanor offenses. In this South Florida district and others across the country, minority students have been disproportionately arrested, sometimes for offenses that resulted in only a warning for their white peers. 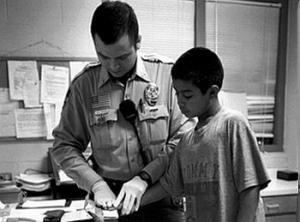 Nationwide, over 70 percent of students involved in school-related arrests or law enforcement referrals are black or Hispanic, according to U.S. Department of Education data. "It's pretty rare," Michael Krezmien, a professor at the University of Massachusetts Amherst, said of the agreement. "I think if every other school district did it that would be a great step forward." The new policy creates a matrix for district officials and school resource officers to follow when a student misbehaves. For non-violent misdemeanors like trespassing, harassment, incidents related to alcohol, possession of a misdemeanor amount of marijuana and drug paraphernalia, administrators are instructed to try and resolve the situation without an arrest. A variety of alternatives, like participation in a week-long counseling program, are designed to address and correct the student's behavior. No student would be arrested for a first non-violent misdemeanor, but further offenses will result in graduated levels of school-based interventions. After a fifth incident, students are referred to law enforcement. Felonies or serious threats will still be handled by police. The policy went into effect at the beginning of the current school year, and Broward Superintendent Robert Runcie said the district has already seen a 41 percent decline in the number of school-related arrests. Runcie became superintendent two years ago, and said one of the first things he did was look at student achievement and outcomes. One of the data sets that stood out to him the most showed black male students in particular falling behind academically. When he dove further into the data, he found the same group was misrepresented in terms of expulsions and arrests. "One other thing I heard quite a bit about was students being arrested for things that I would never have believed constituted an arrest," Runcie said. "For example, tardiness. Trespassing. Throwing spit balls. Things that you just, using a common sense approach, would say, we wouldn't want to do this to a child because once you get a record, it basically stays with you for your life." Runcie worked with the NAACP to create a new student code of conduct. The NAACP said they had attempted to address student discipline with two previous superintendents, without any success. "Everybody deserves a second chance and this program will do just that," said Marsha Ellison, president of the Fort Lauderdale/Broward County NAACP. "And all students will be treated equally no matter what the color of their skin." The NAACP said they hope the policy will serve as a model for other districts nationwide. "People are, I think, becoming more knowledgeable as they see the data and more willing and wanting to fix this problem," said Niaz Kasravi, the NAACP's criminal justice director. Krezmien said large school districts in particular have struggled to come up with alternatives to zero-tolerance policies because they are often following state guidelines that define what a school disciplinary problem is. "I think most of them are kind of stuck because they don't have a good model, or they don't have an infrastructure within the school to deal with what really are, most behaviors, school disruptions," Krezmien said. "It's amazing how a disruptive behavior can be deemed a threat and suddenly, it's a kid who's in court over that." He said creating a policy and implementing it, however, are two distinct challenges, and it will be key for both administrators to receive proper training and for the role of police to be redefined. Despite data showing the negative consequences of policies that criminalize student misbehavior, Krezmien said there has not been an overall push toward creating zero-tolerance alternatives and said the Broward agreement was unusual. The U.S. Justice Department and the Department of Education's Office of Civil Rights have addressed the issue in individual school districts. In Missisippi, a federal judge has scheduled a December 2014 trial for a Justice Department lawsuit that claims there is a "school-to-prison pipeline" in part of the state that locks up students for minor infractions like flatulence or vulgar language. Follow Christine Armario on Twitter.